Yo: all photos by Jennifer Silverberg. Hi! Depending on when you read this, I’m currently opening boxes and finding homes for things, or feverishly painting the house. It’s all going at a decent clip – well, the painting is: the boxes are getting shoved in the basement until I can really commit to doing them correctly. I’m for sure not avoiding them. For sure. I’m sitting on a backlog of posts to read, comments to reply to, and emails to return. Meanwhile, all the non-moving work I’ve been doing is trickling out, so I thought I’d take a crack at being a responsible adult and talk about it. When I said I was working on a few collections during the move, I didn’t mention that those two collections couldn’t have been more different. You saw the Easter one – full of brunchy goodness, pretty classic, a wee bit French, and simple. The second feature? Feast wanted me to learn how to cook with a wok. As in, get a wok and study. As in, Asian homework. Oh, and then tell people how to do it, and also whip up some simple recipes that one could make in aforementioned wok. Sure. WHY NOT. No way I’d be nervous, especially since we have zero shortage of local Asian cuisine heavyweights who would wonder why they let a total noob write an article. Total confidence: can you feel it? This was my first first-person essay-style article for the magazine (usually it’s just me introducing the recipes a little bit, and then off you go), which was refreshing: it’s way more like what I do over here, and I hope I get to do it again. I’ll skip the actual “Shannon goes to cooking school” bit (and also my curious background in Asian cuisine) so you can read the article, and I really hope you do. I learned a lot about how to wok at home, which yes, can be pretty intimidating. Although I’m no expert yet, my goal in writing it was to convey how (really!) simple wok cooking can be if you equip yourself with the proper tools, both in a physical way as well as in a knowledge way. I learned wok technique at the Culinary Institute of Saint Louis at Hickey College: they are the hands-down nicest group of faculty, staff and students I’ve ever run across at a college, ever. Everyone had a smile and an exuberant “Hi!” as you walked past, everyone pitched in to help us load in and find empty rooms to film in. We were there during normal class hours, which means we shifted rooms because actual learning was going on, but it was no big deal because seriously the whole school seemed to be stoked we were there. The recipes I created for the feature build on each other, and they also allow you to practice a range of ways to use a wok. These photographs are all done by Jennifer Silverberg, my regular photographer, whom I love for myriad reasons. We took our show on the road for this one; instead of shooting at the house, we shot on location at the culinary school. Chinese Chicken Stock – A basic which you’ll use in a few recipes, like the stir fry sauce and the soup, and honestly, you should just make this to eat. It’s warm and gingery and perfect when you’re in need of broth, STAT. 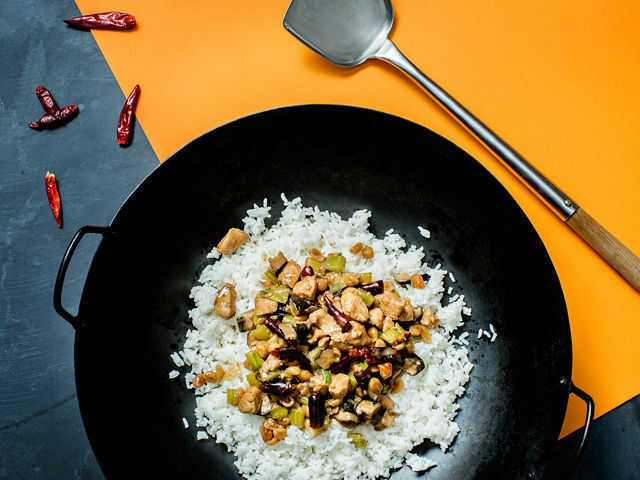 Basic Stir-Fry Sauce – You throw a bunch of things together in a wok and make sauce magic: this makes an easy double or triple batch. 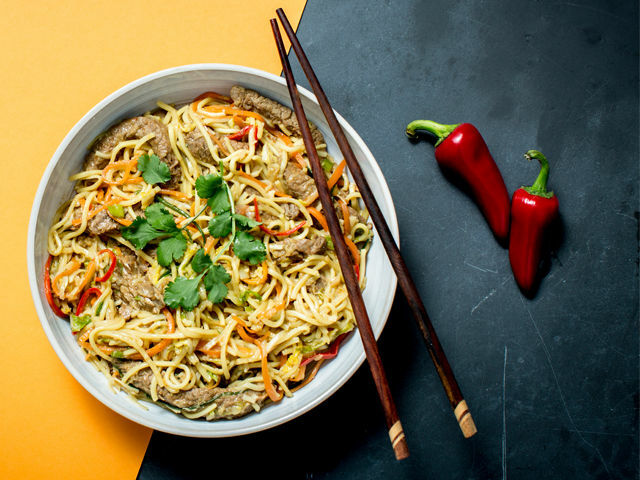 Ginger Beef and Vegetable Noodles – Half beef, have crunchy ribboned vegetables, total comfort food. Lighter than you’d think thanks to the hefty amount of freshness in here. 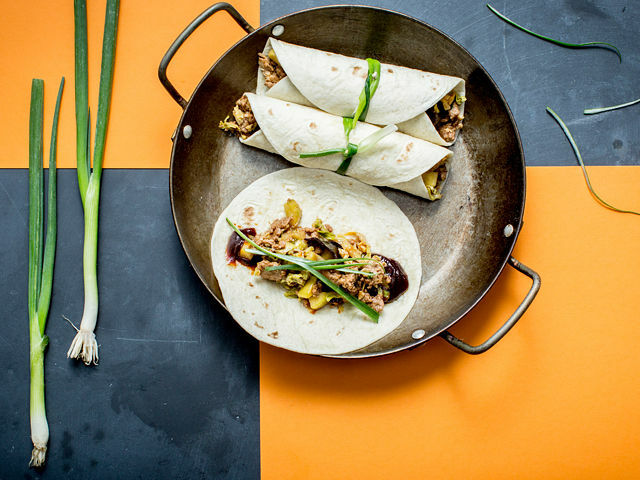 Moo-Shy Pork – Like I say in the recipe description, it’s like Asian soft tacos, and i mean that in the best way possible. 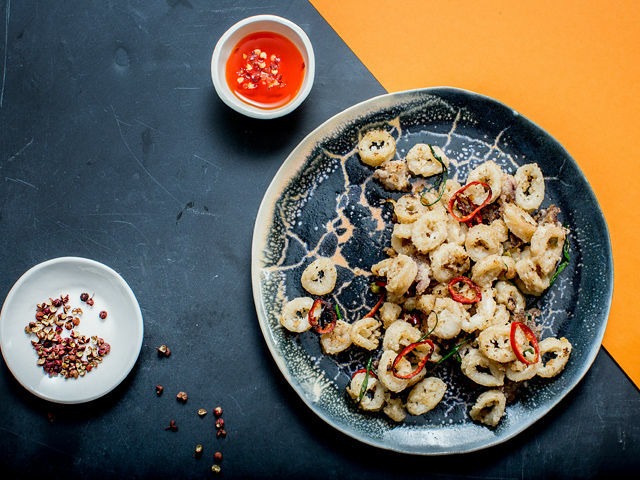 Sichuan Pepper and Fennel Calamari – Just what you think of when you think of calamari, only with a little bit of sichuan and chili. 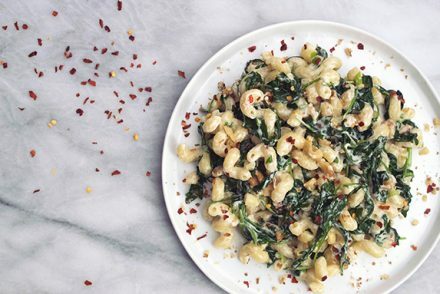 Make these to pick at as you wait for dinner. 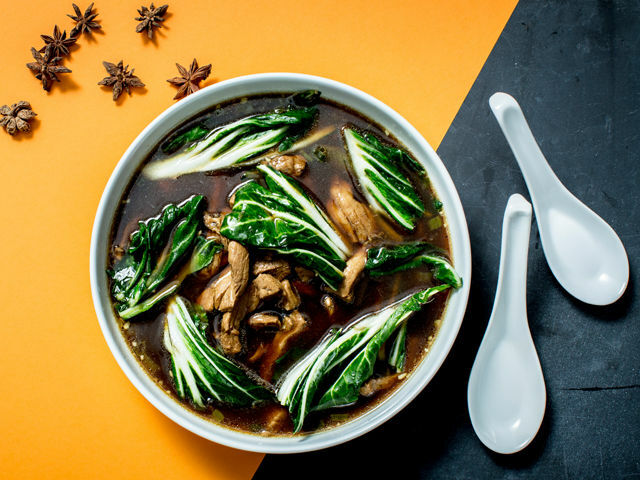 Pork and Bok Choy Soup – I never thought about making soup in a wok, but it’s a fabulous way to do it: the aromatics head in, then the veg, then you throw in the broth and cook the meat inside it until it’s done. This takes the chicken-y broth and transforms it into a deeply earthy number, thanks to the pork marinade. Spicy Chicken with Peanuts – If i had to pick a favorite, or tell you what to make first, this would be the one. It’s a “ding,” meaning everything is simply diced into 1/2-inch pieces, cooked, and sauced. 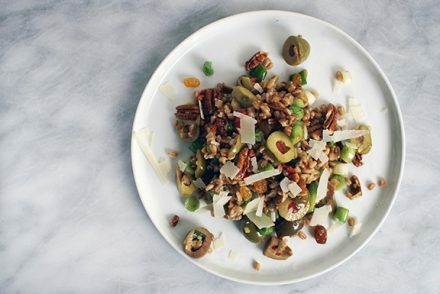 Peanuts, celery, mushrooms and chicken mean there’s a variety of textures, which is incredibly satisfying. It’s definitely spicy, but won’t burn your face off. I’d eat this one every day. Locals, this one is in the magazine, which came out last Friday and should still be in stores; go grab a copy because Jennifer’s photos are simply stunning. We were tasked to do something a bit different visually with this, and I think she accomplished it brilliantly. It’s not the normal aesthetic for our work together, but I think you can see her beautiful perspective in every photograph. I can’t ever say enough about her because I truly value both our friendship and our collaborations. I don’t know how rare it is to work regularly with a photographer who treats their work with the exact balance of seriousness and joy that you do, but when you do work with that person, it’s magical. Thanks, Jenn. You can see more of her work here, but also throughout the magazine: she photographs my column, among other things. This month’s column features enoki mushrooms, which I’ll talk about more in the very near future. 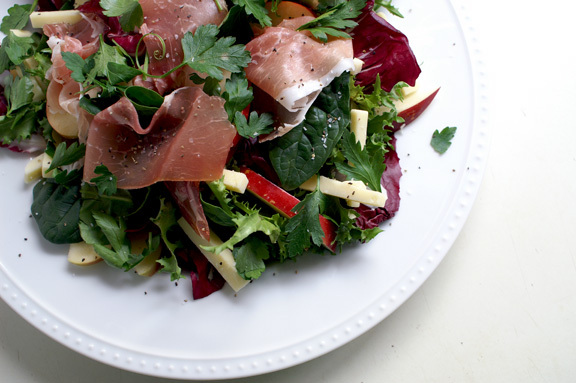 farmhouse salad with wheat beer vinaigrette. we received a wok as a wedding gift but haven’t been at home long enough to season it! and so we stare at it longingly in the brief moments that we’re at home, waiting and wishing for future times with it. it’ll happen! Shannon, this is so amazing!!! I have been wanting a wok for ages, but kept putting it off because there are so few things I knew I would use it for. This changes everything. And Jennifer’s photos are *so* beautiful, I had to stop and gawk at each one! Heading over to read your article, and then add a wok to my wishlist. P.S., congrats on the move! I know there’s probably so much work to do still, but still — congratulations are in order! Thank you Willow! Get one! 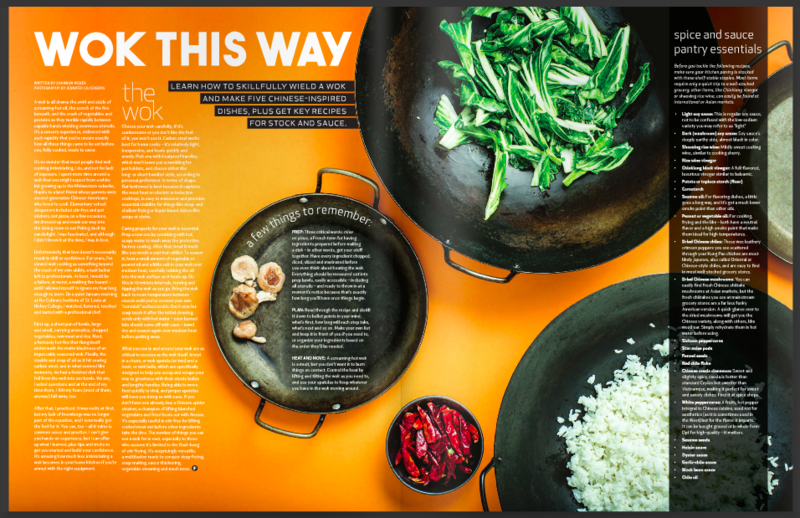 They’re completely affordable – i had no idea, but i was delighted to find that some of the best woks are the most inexpensive of the bunch – and fun to work with, provided you know a few things about it before you tackle it. If you feel like diving in, let me know! I’m totally up for answering questions if i can. Isn’t her work just lovely? She’s one of those naturally gifted photographers that just *knows* how to capture things perfectly. ha! thanks Ashley: i should definitely mention that I had some QUALITY help along the way courtesy of a fine teacher at the culinary school I worked at, the internets, and copious cookbook research. 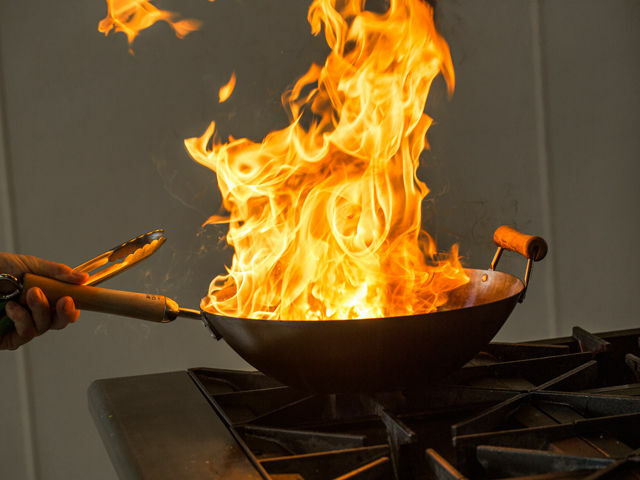 Turns out, all you need is a little know-how to knock out (most) of the fears surrounding wok cooking, and i’m proof of that. I don’t know everything, and there’s definitely room to grow, but I hope the article gets some of you on board with wok cooking. Love Chinese cooking. Love to eat Chinese. Love Chinese teachers and kids who live in China! What fun you must have had! Now I need to read this mag! I love all of that too! This was definitely a great issue, and I really enjoyed being a part of it. Good work.Thanks for sharing this content. I love wok. Can I get info about how to use wok?